Is it too soon to be posting Halloween costume ideas? Probably. But blame it on Kelly. 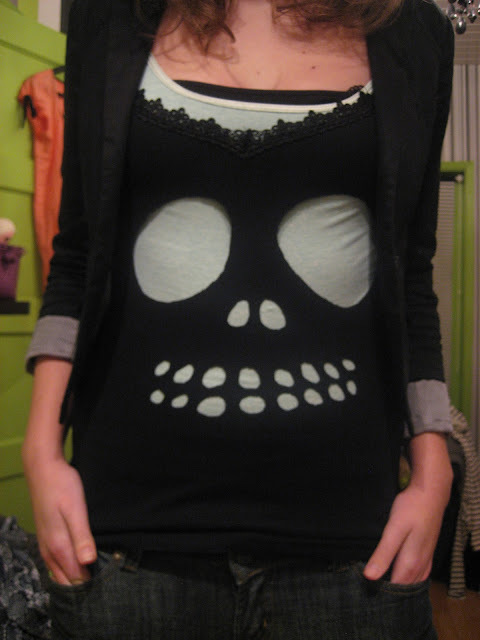 She shared a link to this fun idea for a DIY skeleton shirt from Cut Out and Keep and I couldn't help myself. I want to make this! I'm just a little worried about the eye placement. One little slip, and it's kind of...going to attract a lot of sleazy looks in the wal-mart parking lot, you know? I have to agree with Helena! It's a smart idea, though! Thanks for sharing, Lorie!